Actinobacillus pleuropneumoniae (A. pleuropneumoniae) causes fibrino-hemorrhagic necrotizing pleuropneumonia in pigs. Production of proinflammatory mediators in the lungs is an important feature of A. pleuropneumoniae infection. However, bacterial components other than lipopolysaccharide involved in this process remain unidentified. The goals of this study were to determine the role of A. pleuropneumoniae exotoxin ApxI in cytokine induction and to delineate the underlying mechanisms. Using real-time quantitative PCR analysis, we found native ApxI stimulated porcine alveolar macrophages (PAMs) to transcribe mRNAs of IL-1β, IL-8 and TNF-α in a concentration- and time-dependent manner. Heat-inactivation or pre-incubation of ApxI with a neutralizing antiserum attenuated ApxI bioactivity to induce cytokine gene expression. The secretion of IL-1β, IL-8 and TNF-α protein from PAMs stimulated with ApxI was also confirmed by quantitative ELISA. In delineating the underlying signaling pathways contributing to cytokine expression, we observed mitogen-activated protein kinases (MAPKs) p38 and cJun NH2-terminal kinase (JNK) were activated upon ApxI stimulation. Administration of an inhibitor specific to p38 or JNK resulted in varying degrees of attenuation on ApxI-induced cytokine expression, suggesting the differential regulatory roles of p38 and JNK in IL-1β, IL-8 and TNF-α production. Further, pre-incubation of PAMs with a CD18-blocking antibody prior to ApxI stimulation significantly reduced the activation of p38 and JNK, and subsequent expression of IL-1β, IL-8 or TNF-α gene, indicating a pivotal role of β2 integrins in the ApxI-mediated effect. Collectively, this study demonstrated ApxI induces gene expression of IL-1β, IL-8 and TNF-α in PAMs that involves β2 integrins and downstream MAPKs. Actinobacillus pleuropneumoniae (A. pleuropneumoniae) is the etiological agent of porcine pleuropneumonia characterized as an exudative, fibrinous, hemorrhagic, and necrotizing pneumonia along with pleuritis . Multiple factors of A. pleuropneumoniae including lipopolysaccharide (LPS), A. pleuropneumoniae exotoxins (Apx), polysaccharide capsule and etc. may contribute to the disease [2–5]. Among these, Apx toxins are the major virulence factors involved in the pathogenesis of pleuropneumonia . For the Apx toxins (ApxI to IV) identified so far, ApxI elicits its most significant effects on hemolysis and cytolysis . Apx toxins are members of the "Repeats in Toxin" (RTX) family that are widespread in Pasteurellaceae which cause infectious diseases, most often in animals but also in humans . RTX toxins display a cytotoxic and/or a hemolytic activity . In addition, Mannheimia haemolytica RTX leukotoxin (Lkt) has been identified as a potent inducer on the gene expression of proinflammatory cytokines such as tumor necrosis factor alpha (TNF-α), interleukin (IL)-1, and IL-8 in bovine alveolar macrophages [9, 10]. There is compelling evidence that pigs naturally or experimentally infected by A. pleuropneumoniae show significantly increased expression of cytokines IL-1, IL-6, IL-8 and TNF-α in lungs [4, 5, 11]. A study on porcine alveolar macrophages indicated multiple components of A. pleuropneumoniae, e.g., killed bacteria, bacterial culture supernatant, crude surface extract, or lipopolysaccharide (LPS), are potent stimulants for IL-1, IL-8 and TNF-α expression . However, up to now, the role of Apx toxins in proinflammatory cytokine expression remains unidentified. The β2 integrins have been identified to serve as a receptor for RTX toxins such as leukotoxin of Aggregatibacter actinomycetemcomitans, α-hemolysin of Escherichia coli, and Lkt of M. haemolytica[12–15]. β2 integrins consist of four members including leukocyte function-associated antigen 1 (LFA-1; CD11a/CD18), Mac-1 (CD11b/CD18), p150,95 (CD11c/CD18), and αdβ2 (CD11d/CD18), that play important roles in cell-matrix interaction and immune response . M. haemolytica Lkt-induced cytotoxic effect on bovine leukocytes can be blocked by an antibody specific to ruminant CD18, suggesting a role of CD18 in Lkt-mediated cytolysis [13, 15, 17]. Moreover, in bovine alveolar macrophages, Lkt-induced intracellular [Ca2+] elevation, which is important for proinflammatory cytokine gene expression, depends on LFA-1 [9, 14, 18]. A recent study on ApxIII toxin revealed porcine, but not bovine or human, CD18 is necessary for mediating ApxIII-induced leukolysis , providing another example of a species-specific effect of RTX using the CD18 subunit of β2 integrins. The mitogen-activated protein kinases (MAPKs) are a family of serine/threonine protein kinases that are important regulators in a variety of cellular activities . A plethora of studies have revealed proinflammatory cytokines are regulated by MAPKs, such as p38, cJun NH2-terminal kinase (JNK), and extracellular signal-regulated kinase (ERK) [21–25]. Since production of proinflammatory cytokines in lungs is an important defense mechanism in response to pathogens , the goals of this study were to examine the effect of ApxI on cytokine expression in PAMs and to determine the potential involvement of MAPKs and β2 integrins in this event. Brain-heart infusion (BHI) was from Becton, Dickinson and Company (Franklin Lakes, NJ, USA). The nicotinamide adenine dinucleotide (NAD), polymyxin B, 2,3-bis(2-methoxy-4-nitro-5-sulfophenyl)-2H-tetrazolium-5-carboxanilide inner salt (XTT), trypan blue, and anti-β-actin antibody were from Sigma Aldrich (Saint Louis, MO, USA). The p38 inhibitor SB203580 and JNK inhibitor SP600125 were from Calbiochem (Darmstadt, Germany). Antibody specific to active, phosphorylated p38 or JNK was from Promega (Madison, WI, USA). A blocking antibody specific to porcine CD18 was purchased from SeroTec (Kidlington, Oxfordshire, United Kingdom). Porcine alveolar macrophages (PAMs) were obtained from 3- to 6- week old healthy piglets through lavage and stored in liquid nitrogen using previously described procedures . Piglets were euthanized according to the protocol approved by the Institutional Animal Care and Use Committee (IACUC) of National Chung Hsing University. For the experiments, PAMs were thawed, resuspended in culture medium RPMI-1640 supplemented with 10% fetal bovine serum (FBS), 2 mM L-glutamine, 100 U/mL penicillin, and 100 μg/mL streptomycin (Invitrogen, Carlsbad, CA, USA) and seeded into cell culture plates as indicated below. Actinobacillus pleuropneumoniae serotype 10 (strain 13039) was a kind gift from the Animal Health Research Institute, Council of Agriculture, Republic of China. It secretes only ApxI but not ApxII and ApxIII . Preparation of the ApxI was performed according to the procedures described previously . Briefly, colonies of A. pleuropneumoniae serotype 10 on BHI agar plates containing 10 μg/mL NAD were transferred to BHI broth supplemented with 10 μg/mL NAD and cultured at 37°C for 5 h. The BHI broth was then replaced by RPMI-1640 supplemented with 2% FBS and 10 mM CaCl2 and cultivated for an additional 2 h. Subsequently, the bacterial culture supernatant was collected by centrifugation at 16 000 × g for 10 min at 4°C followed by passage through a filter with pore-size of 0.45 μm. The filtered preparation containing native exotoxin ApxI was aliquoted and stored at -70°C for further experiments. The cytotoxic activity of ApxI was determined using an XTT assay as described previously . One cytotoxic unit (CU) of ApxI was defined as the quantity of toxin causing a 50% reduction in mitochondrial activity of 2 × 105 PAMs. Limulus amebocyte lysate test (Cambrex Bio Science, Walkersville, MD, USA) was performed according to the manufacturer's instructions. It was found that the preparation containing 1 CU/mL ApxI had a level of 307 endotoxin units (EU)/mL. To minimize the effect of contaminating LPS in the exotoxin preparation, polymyxin B was added to a final concentration of 10 μg/mL throughout the study except where indicated otherwise. PAMs were seeded to 35-mm tissue culture plates at a density of 2 × 106 cells/plate in culture medium and incubated at 37°C in 5% CO2 overnight. Cells were washed once and replenished with low serum medium (LSM; RPMI-1640 supplemented with 1% FBS, 2 mM L-glutamine, 100 U/mL penicillin, and 100 μg/mL streptomycin) containing 0-2 CU/mL of ApxI and incubated for 0-12 h as indicated elsewhere. To abolish the bioactivity of ApxI, exotoxin was incubated at 98°C for 1 h or pre-incubated with 20 μg/mL antiserum raised against a recombinant subunit ApxI protein for 30 min at 37°C prior to applying to PAMs in the indicated experiments . In experiments examining the roles of mitogen-activated protein kinases (MAPKs) and β2 integrins on ApxI-induced cytokine expression, PAMs were incubated with LSM containing 10 μM p38 inhibitor SB203580, 10 μM JNK inhibitor SP600125, or 5-10 μg/mL anti-porcine CD18 antibody for 1 h prior to stimulation with 0.5 CU/mL of ApxI. The levels of cytokine mRNA in PAMs were evaluated by RT-qPCR at 2 h post ApxI stimulation as described above. Total RNA of PAMs was extracted using High Pure RNA Isolation Kit (Roche Applied Science, Mannheim, Germany) according to the manufacturer's instructions. cDNA synthesis and RT-qPCR analysis were performed as follows. Total RNA extracted from PAMs was quantified by detection of light absorption at 260 nm using a NanoVue instrument (GE Healthcare Bio-Sciences Corp, Piscataway, NJ, USA) and ~1 μg of RNA was used for cDNA synthesis. To prepare a 20 μL reaction solution, RNA was mixed with 0.5 μg Oligo(dT)15 primer (Promega) in each PCR tube and incubated at 65°C for 10 min to ensure the denaturation of the RNA secondary structures. Subsequently, the tube was immediately placed on ice prior to adding 20 U RNasin® ribonuclease inhibitor (Promega), 20 nmole dNTP, and 10 U Transcriptor Reverse Transcriptase with 1 × reaction buffer (Roche Applied Science), and a final volume adjusted to 20 μL with distilled water. cDNA synthesis was carried out at 55°C for 30 min and the activity of reverse transcriptase was inactivated by heating the solution to 85°C for 5 min. In this study, a 10-fold dilution of the synthesized cDNA was used as a template for RT-qPCR analysis. The sequences of oligonucleotide primers used in this study are listed in Table 1. Primers for interleukin-1 beta (IL-1β), tumor necrosis factor alpha (TNF-α), and glyceraldehyde-3-phosphate dehydrogenase (GAPDH) genes were designed based on porcine cytokine sequences obtained from the National Center for Biotechnology Information (NCBI) using Lasergene software version 5.07 (DNASTAR Inc, Madison, WI, USA). Primers for IL-8 gene were synthesized according to Cho et al. .
Real-time PCR amplification was performed using the LightCycler® 480 SYBR green I master with a LightCycler® 480 instrument (Roche Applied Science). Briefly, to prepare the 2 × master mix, primers of the target gene were added into the LightCycler® 480 SYBR green I master to a concentration of 0.4 μM. Five microliters of 2 × master mix was further aliquoted to every well of the 96-well reaction plate, followed by addition of 5 μL of the cDNA sample. The reactions were carried out as an initial pre-incubation at 95°C for 5 min, followed by 45 amplification cycles of: 95°C for 10 s, 58°C or 48°C for 10 s, and 72°C for 15 s. Melting curve analysis was performed immediately after amplification from 65 to 95°C with continuous fluorescence acquisition. In each reaction, the cycle number at which the fluorescence rises appreciably above the background fluorescence is determined as crossing point (CP). In this study, the background fluorescence and the CP values are automatically calculated by the software (version 1.5). The level of cytokine gene expression was analyzed using the "Delta-delta method" for relative quantification . The expression of the selected cytokine gene was normalized to that of the reference GAPDH gene using the equation 2-[ΔCP sample - ΔCP control] = 2 -ΔΔCP and further converted to relative mRNA expression. In experiments assessing the kinetics of ApxI on cytokine gene expression, the relative mRNA expression was further normalized to the percent of cell survival at each time point. To quantify the protein levels of cytokines, 2 × 106 PAMs were stimulated with 1 CU/mL of ApxI for 4 h. In the inhibitor experiments, 1 × 106 PAMs were incubated with 0.5 CU/mL ApxI for 8 h. After treatments, culture supernatants were collected following centrifugation at 700 × g for 10 min. The levels of cytokines IL-1β, IL-6, IL-8, and TNF-α in the culture supernatants were determined by quantitative DuoSet® ELISA kits (R&D Systems, Minneapolis, MN, USA) according to the manufacturer's instructions. The survival rate of PAMs was assessed using a trypan blue exclusion test . Briefly, after ApxI treatment, PAMs were collected by trypsinization, stained with 0.1% trypan blue, and observed using a microscope. Cells stained blue were scored as non-viable. At least 500 cells were counted for each treatment of at least triplicate determinations. Percent of cell survival was calculated as follow: 100 × [1 - (% cell death at each time point - % cell death at 0 h)]. In experiments examining MAPK activation, 2 × 106 cells PAMs in 35-mm tissue culture plates were stimulated with 0.5 CU/mL ApxI for 1 h. Thereafter, cells were washed once with ice-cold phosphate buffered saline (PBS) and lysed in a lysis buffer (1% Triton X-100, 20 mM Tris-Cl, 137 mM NaCl, 25 mM β-glycerophosphate, 2 mM NaPPi, 1 mM Na3VO4, 10% glycerol, 2 mM EDTA, 10 μM leupeptin, 0.77 μM aprotinin, 0.5 mM DTT, 10 mM PMSF, and 2 mM benzamidine; pH 7.4) . Cell lysates were centrifuged at 15 000 × g for 10 min and supernatants harvested. The protein concentration of the cell lysate was determined using the Bradford assay (Bio-Rad Laboratories, Hercules, CA, USA). Twenty to thirty μg of each lysate was analyzed by Western blot analysis using an antibody specific to active, phosphorylated p38 or JNK. Immunoblots were reprobed with an anti-β-actin antibody as a loading control. The intensity of the active p38 or JNK was quantified using ImageJ software, version 1.37v (National Institutes of Health), and normalized to the intensity of the loading control β-actin. Data were obtained from three independent experiments of at least triplicate determinations. Statistical analysis was performed using one-way analysis of variance (ANOVA). The error bars represent the standard error of mean (SEM). To evaluate the effect of A. pleuropneumoniae serotype 10-derived ApxI on proinflammatory cytokine gene expression, porcine alveolar macrophages (PAMs) were incubated with 0-2 CU/mL of ApxI for 2 h and subjected to real-time quantitative PCR (RT-qPCR) analysis. Significant elevation of mRNA levels of IL-1β, IL-8 and TNF-α was noted in PAMs treated with 0.2 to 2 CU/mL of ApxI (p < 0.001) (Figure 1A). The levels of cytokine mRNA increased as the concentration of ApxI elevated to 1 CU/mL, indicating a concentration-dependent effect of ApxI. Substantial levels of mRNA expression were noted in cells treated with ≥ 0.5 CU/mL (Figure 1A). In subsequent experiments, ApxI at 0.5 or 1 CU/mL was used throughout. A. pleuropneumoniae exotoxin ApxI induces IL-1β, IL-8 and TNF-α mRNA expression of porcine alveolar macrophages (PAMs) in a concentration- and time-dependent manner. (A) PAMs were stimulated with 0-2 CU/mL ApxI in the presence (w/) or absence (w/o) of polymyxin B (PMB) for 2 h. Total RNA of PAMs was extracted for cDNA synthesis and subjected to RT-qPCR. (B) PAMs were treated with 1 CU/mL ApxI in the presence of PMB for 0-12 h and subjected to RT-qPCR. The expression levels of cytokines were further normalized to corresponding survival rate of PAMs at each time point. Data are representative of three independent experiments of at least triplicate determinations. The error bars are SEM. In addition, cytokine expression was compared in the absence and presence of an LPS-blocker polymyxin B (PMB). It was noted that 1 CU/mL ApxI preparation without PMB elicited mRNA expression of IL-1β, IL-8, and TNF-α at a level ~8-, 2-, and 13-fold higher than that treated with ApxI in the presence of PMB, respectively (Figure 1A). To assess the kinetics of ApxI on proinflammatory cytokine gene expression, PAMs were treated with 1 CU/mL of ApxI for varied time periods and mRNA levels were evaluated using RT-qPCR. The mRNA levels of IL-1β, IL-8 and TNF-α elevated at 1 h following ApxI treatment (Figure 1B). The maximal levels of mRNA expression of all three cytokines were observed at 4 h. At 8 or 12 h, the mRNA levels of all these cytokines were less than 63% of the maximal levels (Figure 1B). Collectively, these findings demonstrate A. pleuropneumoniae serotype 10-derived ApxI induces IL-1β, IL-8 and TNF-α gene expression in PAMs in a concentration- and time-dependent manner. To demonstrate cytokine gene expression in PAMs is truly attributable to the bioactivity of ApxI, ApxI was heat-inactivated (ΔApxI) or pre-incubated with an antiserum raised against a recombinant subunit ApxI protein  before application to PAMs and subjected to RT-qPCR analysis. PAMs treated with ΔApxI had mRNA level of IL-1β, IL-8 or TNF-α that was not significantly different from cells without treatment (Figure 2). Moreover, PAMs treated with serum-neutralized ApxI showed a 70-84% attenuation in IL-1β, IL-8 or TNF-α mRNA expression level, indicating IL-1β, IL-8 or TNF-α gene expression is ascribed to the bioactivity of ApxI. Bioactivity of ApxI is required for induction of proinflammatory cytokine gene expression. PAMs were treated with 0.5 CU/mL of ApxI, heat-inactivated ApxI (Δ), or ApxI pre-incubated with an antiserum raised against recombinant subunit ApxI protein (rA). Medium without ApxI toxin served as a negative control (C). Two hours after stimulation, the total RNA of PAMs was extracted for RT-qPCR analysis. Data are representative of three independent experiments of at least triplicate determinations. To confirm the effects of ApxI on the protein level of cytokine induction, PAMs were incubated with 1 CU/mL ApxI for 4 h and cell culture supernatants analyzed using quantitative ELISA. Incubation of ApxI resulted in secretion of ~650 pg/mL of IL-1β, 30 ng/mL of IL-8, and 3.2 ng/mL of TNF-α from PAMs (Figure 3). 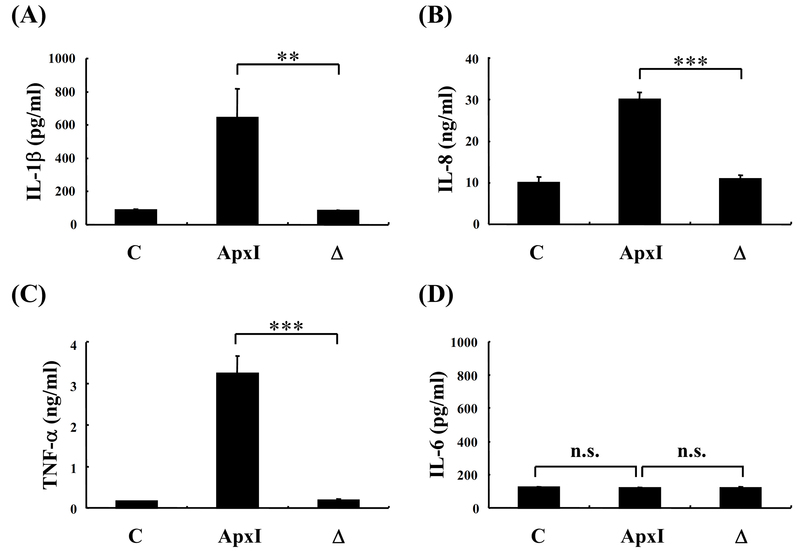 Cells stimulated with ΔApxI had a level of 84 pg/mL of IL-1β in culture supernatant that was not significantly different from cells without treatment (Figure 3A). A similar pattern was also observed for the protein levels of IL-8 and TNF-α in cells treated with ΔApxI and non-treated cells (Figures 3B and 3C). Interestingly, only the basal level (~120 pg/mL) of IL-6 was detected in ApxI-treated PAMs, which was similar to that in cells without treatment or treated with ΔApxI (Figure 3D). Protein levels of proinflammatory cytokines secreted from PAMs treated with ApxI. 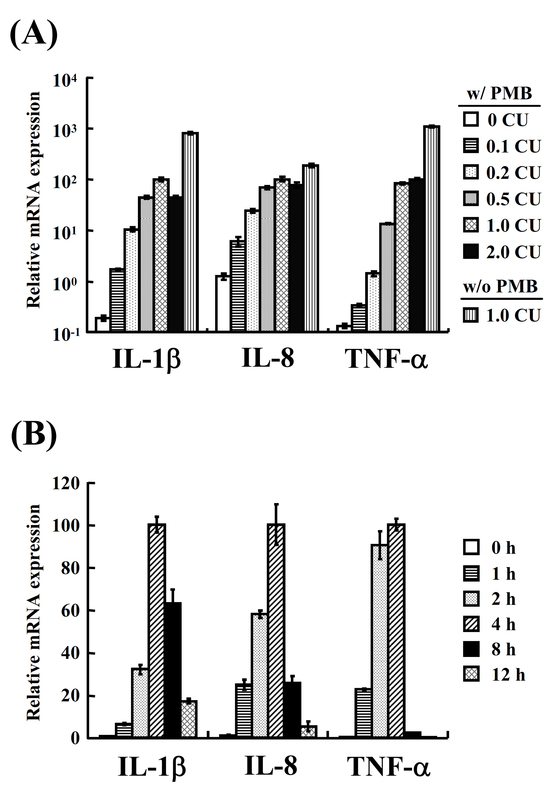 PAMs were stimulated with 1 CU/mL of ApxI, heat-inactivated ApxI (Δ), or control medium (C) for 4 h. Subsequently, culture supernatants were collected and the protein levels of IL-1β (A), IL-8 (B), TNF-α (C) and IL-6 (D) determined by ELISA. The results are the average of three independent experiments of triplicate determinations. **p < 0.01; ***p < 0.001; n.s. : no significant difference from each other. A plethora of studies indicate members of MAPK family play important roles in proinflammatory cytokine induction [21–25]. These findings prompted us to examine the roles of MAPK members p38 and JNK in ApxI effect. PAMs stimulated with 0.5 CU/mL of ApxI for 1 h were subjected to Western blot analysis for active p38 and JNK. ApxI treatment induced an appreciable increase in both active, phosphorylated p38 and JNK in PAMs (Figure 4A). 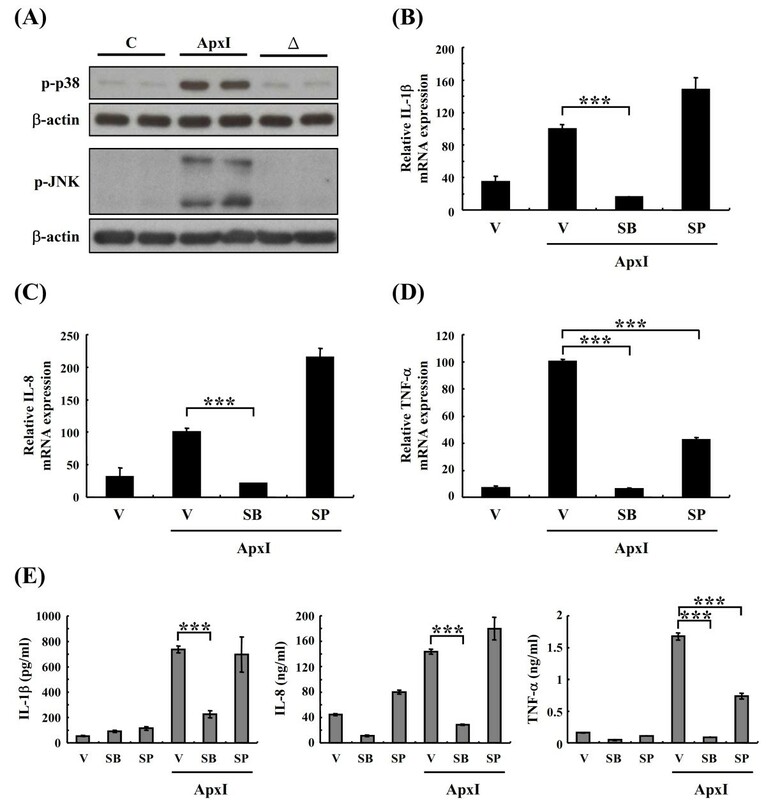 Low levels of phosphorylated p38 were noted in cells treated with ΔApxI that did not significantly differ from non-treated control cells, and there was no detectable phosphorylated JNK in ΔApxI-treated or control cells, suggesting the activation of JNK and p38 MAPK is attributable to ApxI. p38 and JNK mediate ApxI-induced proinflammatory cytokine production. (A) PAMs were stimulated with 0.5 CU/mL of ApxI, heat-inactivated ApxI (Δ), or control medium (C) for 1 h. Subsequently, cells were lysed and subjected to Western blot analysis using an antibody specific to phospho-p38 (p-p38) or phospho-JNK (p-JNK). (B-D) PAMs were pre-incubated with a p38 inhibitor SB203580 (SB), a JNK inhibitor SP600125 (SP), or vehicle DMSO (V) for 1 h, followed by stimulation with 0.5 CU/mL ApxI for 2 h. PAMs were subjected to RT-qPCR analysis for mRNA levels of IL-1β (B), IL-8 (C), and TNF-α (D). (E) PAMs were pre-incubated with SB, SP, or DMSO for 1 h, followed by stimulation with 0.5 CU/mL of ApxI for 8 h. Subsequently, the culture supernatants were collected and the protein levels of IL-1β, IL-8, and TNF-α were determined by ELISA. Data are representative of three independent experiments of at least triplicate determinations. ***p < 0.001. To further assess the role of p38 or JNK in ApxI-induced cytokine expression, PAMs were pre-treated with an inhibitor specific to p38 (SB20358) or JNK (SP600125), or vehicle DMSO for 1 h, followed by stimulation with 0.5 CU/mL ApxI for 2 h, and subjected to RT-qPCR analysis. Treatment of p38 inhibitor prior to ApxI stimulation significantly attenuated IL-1β mRNA level by 83%. However, the JNK inhibitor did not attenuate the mRNA expression of IL-1β (Figure 4B). Similarly, ApxI-induced IL-8 mRNA expression was inhibited by p38 inhibitor up to ~85%, but not by JNK inhibitor (Figure 4C). Distinguishably, both p38 and JNK inhibitors blocked ApxI-induced TNF-α mRNA expression by 92% and 54%, respectively (Figure 4D). To confirm our findings, the cytokines secreted from PAMs pre-treated with inhibitors and stimulated with ApxI were also evaluated by quantitative ELISA. In the presence of the p38 inhibitor, the protein levels of IL-1β, IL-8 and TNF-α were significantly inhibited by 69-95% compared to cells without inhibitor pre-treatment and stimulated with ApxI (Figure 4E). Notably, the JNK inhibitor attenuated the protein level of TNF-α, but not IL-1β or IL-8 (Figure 4E). These data suggest that MAPK p38 plays a major role in ApxI-induced IL-1β, TNF-α, and IL-8 expression, while JNK participates only in ApxI-induced TNF-α expression. The common subunit CD18 of β2 integrins is necessary for A. pleuropneumoniae ApxIII-induced leukolysis . To examine whether ApxI-induced MAPK activation was attributable to ApxI-β2 integrin interaction, a blocking antibody of porcine CD18 was applied to PAMs 1 h prior to stimulation with 0.5 CU/mL ApxI and analyzed by Western blot analysis. In the presence of CD18 antibody, ApxI-induced p38 activation was significantly inhibited by 20-30% (Figure 5A). Cells treated with the control medium or medium containing CD18 antibody displayed only a basal level of phosphorylated p38. Similarly, blocking of CD18 on PAMs resulted in attenuation of ~65% ApxI-activated JNK phosphorylation (Figure 5B). However, phosphorylated JNK was not observed in cells treated with the control medium or medium containing CD18 antibody. Further, to evaluate the effect of ApxI-β2 integrin interaction on cytokine mRNA expression, PAMs were pre-incubated with CD18 antibody, stimulated with 0.5 CU/mL ApxI for 2 h, and subjected to RT-qPCR analysis. Blocking of CD18 molecule attenuated IL-1β, IL-8 and TNF-α mRNA levels by 82-95%. Cells treated with control medium or medium containing CD18 antibody displayed similar basal levels of IL-1β, IL-8 and TNF-α mRNA (Figure 5C). Collectively, these results indicate CD18 plays a pivotal role in ApxI-mediated MAPK activation and expression of proinflammatory cytokine genes in PAMs. CD18 mediates p38 and JNK activation and proinflammatory cytokine mRNA expression. (A and B) PAMs were pre-incubated with CD18 blocking antibody (Anti-CD18) for 1 h prior to stimulation with 0.5 CU/mL ApxI or control medium (C) for an additional 1 h. Thereafter, cells were lysed and subjected to Western blot analysis with an antibody to phospho-p38 (p-p38) or phospho-JNK (p-JNK). The average intensity of p-p38 or p-JNK isoforms (p46 and p55) was quantified and normalized to the intensity of β-actin (A and B, lower panel). (C) PAMs were pre-incubated with anti-CD18 antibody and stimulated with 0.5 CU/mL ApxI for 2 h, followed by RT-qPCR analysis of cytokine mRNA expression. Data are representative of three independent experiments of at least triplicate determinations. Inflammation plays an essential role in respiratory defense mechanism . In porcine pleuropneumonia, multiple components and virulence factors of A. pleuropneumoniae are suggested to contribute to the production of proinflammatory cytokines . Baarsch et al. demonstrated alveolar lavage cells from pigs endotracheally inoculated with a low-virulence strain of A. pleuropneumoniae serotype 1, i.e., lacking cytotoxic and hemolytic activities, showed similar mRNA level of TNF, IL-1 or IL-8 compared to buffer treated pigs . Moreover, heat-treatment of crude A. pleuropneumoniae bacterial culture supernatant attenuated its ability to induce TNF-α and IL-1 expression in porcine alveolar macrophages (PAMs), suggesting heat-labile components were involved in such stimulation . In this study, we present direct evidence demonstrating a single species of exotoxin ApxI, derived from A. pleuropneumoniae serotype 10, induces the expression and production of proinflammatory cytokines IL-1β, IL-8 and TNF-α in PAMs. Also, we found that, at low concentration such as 0.5 or 1 CU/mL, ApxI did not cause significant cell death within 4 h, and > 68% of PAMs survived at 12 h of stimulation (data not shown). Since alveolar macrophages are one of the first line defense cells in lungs, at the early stage of A. pleuropneumoniae infection, PAMs may be a source of inflammatory mediators contributing to innate immunity. Nevertheless, PAMs may not be the only source of proinflammatory cytokines during A. pleuropneumoniae infection. For instance, Baarsch et al. demonstrated expression of cytokine IL-6 in the lung tissue of pigs inoculated with live A. pleuropneumoniae bacteria . However, fibroblasts and epithelial cells, but not alveolar macrophages, might be the source of IL-6 . This is consistent with our findings showing PAMs did not express IL-6 upon ApxI stimulation. Therefore, whether ApxI stimulates inflammatory cytokine IL-1β, IL-8 or TNF-α in other cell types remains to be clarified. Overproduction of proinflammatory mediators in lungs can harm animals . Based on our findings in this study, it is tempting to hypothesize, in addition to the hemolytic and cytolytic effects of ApxI, the toxin may exacerbate lung damages caused by A. pleuropneumoniae through the induction of proinflammatory cytokines. However, to avoid overemphasizing the effect of ApxI, it should be noted that the cell wall component of Gram negative bacteria, i.e., LPS, induces plethora of inflammatory and immunological effects in various cell types , such as TNF, IL-1 and IL-8 production by porcine macrophages [35–37]. Moreover, Ramjeet et al. had demonstrated that the cytotoxicity of ApxI and ApxII was enhanced through interaction with LPS . In our study, we found that in the absence of PMB, ApxI preparation induced significantly higher levels of proinflammatory cytokine expression as compared to treatment of ApxI in the presence of PMB (Figure 1A). These findings indicate both LPS and ApxI are cytokine inducing factors. However, whether LPS contributes to a synergistic or additive effect on ApxI-induced cytokine expression requires further investigation. Mitogen-activated protein kinases (MAPKs) are important signaling molecules involved in the expression of inflammatory mediators in various types of cells [21–25]. Upon MAPK activation, down-stream targets including transcription factors are phosphorylated and activated that in turn bind to the promoter region of target genes . Cooperative involvement of multiple transcription factors is a common theme in the gene regulation of single cytokine. It has been demonstrated activating protein-1 (AP-1; consisting of heterodimers of c-Jun, activating transcription factor-2 (ATF-2), c-Fos, and Jun dimerization protein (JDP)), nuclear factor kappa B (NF-κB), and CAAT/enhancer-binding protein (C/EBP) participate in transcriptional control of IL-8 gene . Similarly, the expression of TNF-α gene is also regulated by C/EBP, NF-κB, and AP-1 (c-Jun/ATF-2) . In addition, it is well-established MAPKs may have overlapping substrate specificity on transcription factors . For example, c-Jun is phosphorylated and activated specifically by JNK, while ATF-2 can be phosphorylated by both JNK and p38 MAPKs [33, 40, 41]. Nevertheless, the involvement of MAPKs in RTX-induced cytokine gene expression has not been identified. In the present study, we showed both p38 and JNK were substantially activated after ApxI stimulation, and these two signaling molecules played differential regulatory roles in cytokine gene expression. Our observations that p38 inhibitor (SB203580) attenuated the expression of IL-1β, IL-8 and TNF-α, while JNK inhibitor (SP600125) attenuated the expression only on TNF-α gene, suggest p38 plays a more important role in ApxI-induced IL-1β, IL-8 and TNF-α expression. These findings are similar to previous studies showing SB203580 inhibited gene expression of IL-1β, IL-8 and TNF-α [21, 23, 25], while SP600125 inhibited gene expression of TNF-α, but not IL-1β or IL-8 . However, the question of which transcription factors are involved in ApxI-induced cytokine expression and the regulatory role of MAPKs on these factors remain to be determined. CD18 of β2 integrins has been proposed as a receptor for ApxIII-mediated leukolysis . In this study, the observations that blocking of CD18 on PAMs resulted in attenuation of ApxI-induced p38 and JNK activation and subsequent cytokine gene expression suggest ApxI-β2 integrin interaction contributes to these events. Nevertheless, current knowledge of signaling pathways underlying β2 integrin-induced MAPK activation is very limited. Studies by Hsuan et al. indicated M. haemolytica Lkt-induced intracellular [Ca2+] ([Ca2+]i) elevation in bovine alveolar macrophages is mediated through a G-protein-coupled mechanism , and [Ca2+]i elevation is crucial for proinflammatory cytokine gene expression . Consequently, a study by Jeyaseelan et al. demonstrated Lkt-induced [Ca2+]i elevation depends on LFA-1 . It has been reported MAPKs are activated by a small G-protein Ras downstream G-protein-coupled receptor (GPCR) signaling pathway [20, 43]. The question of whether ApxI-induced MAPK activation also occurs through a calcium-dependent, G-protein-coupled mechanism leading to cytokine gene expression requires further investigation. In summary, this study provides evidence demonstrating ApxI is able to induce the expression of proinflammatory cytokines IL-1β, IL-8 and TNF-α in porcine alveolar macrophages. This is the first report to demonstrate p38 and JNK play differential regulatory roles in ApxI-induced cytokine gene expression through a CD18-dependent pathway. This work was supported in part by a grant NSC-99-2628-B-005-009-MY3 from the National Science Council of the Republic of China and by the Division of Animal Health, Bayer HealthCare. ZWC performed the experiments and wrote the paper. MSC and SLH designed the experiments. NYC, THC, and CMW assisted with the experiments. CH and WCL assisted with data analysis. SLH developed the original concepts and wrote the paper. All authors read and approved the final manuscript.